More and more water purveyors require or prefer installation of containment backflow preventers above ground at the property line for non-residential water services. This is becoming standard practice in many cities for a couple of reasons. Water systems need these devices visible and easy to access to more effectively protect the distribution system from occurrences like the recent contamination by an industrial water user in Corpus Christi. Installing backflow devices on the property line is one of the best ways to do this and help protect our drinking water. Additionally, water systems want the highest degree of water protection. This is provided by an RPZ backflow preventer. They offer more protection than a double check backflow preventer, but come with an extra requirement. RPZ backflow preventers must be installed above ground. They are typically installed inside a backflow preventer cover to ensure the RPZ can do it's job and is safe from the elements, people, and accidents. Winter is here and it is important to make sure these above ground water safety devices continue to operate properly and are free from freezing. The accepted best practice for protection of these above ground systems is based on ASSE Standard 1060. This standard requires that backflow covers undergo various tests to ensure proper protection. There are five categories of tests in ASSE standard 1060. The American Society of Sanitary Engineering (ASSE) has long been recognized as a leading authority on performance standards for plumbing and backflow prevention and cross connection control. In 1996, the ASSE created a new standard - 1060 - to enumerate the performance requirements for enclosures for outdoor plumbing such as water meters, control valves, fire sprinkler components, and backflow preventers. ASSE 1060 certified heated backflow enclosures have been in the field for many years from manufacturers such as Hot Box® enclosures, Safe-T-Cover™ aluminum enclosures, and others. Climate control is only one of the key five enclosure considerations. Read all five here. 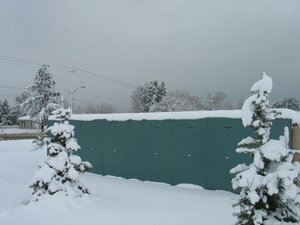 Check the integrity of the enclosure walls, roof, and access panels. Make sure the parts fit together well and the access panels close firmly to prevent air from entering the interior. Look for cracks, bent areas, and broken parts. Contact the manufacturer for any replacements. Check the operation of drain panels and drain openings. The drains provide a means for water to escape the enclosure when the RPZ does what it is designed to do, which is dump used, potentially contaminated, water. Check the integrity of the insulation inside. The walls and roof should have a minimum of R8 insulation thickness. This is normally 1" or more in thickness. If the insulation is thin or missing, contact the enclosure manufacturer. Check the operation of the heat source. If the heat source has a thermostat, increase the set-point to make sure the unit is generating ample heat. Several ASSE 1060 certified enclosure manufacturers offer alarms to signal loss of heat and/or loss of power. To learn more about recommended installation practices for backflow preventers, and backflow covers, there are a variety of resources available online and in print. 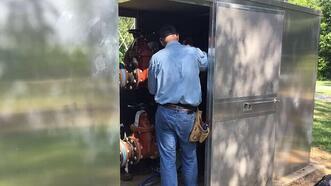 Many of the backflow assembly manufacturers provide guidance. You can check with your local rep or visit the manufacturer's website to find RPZ flow rates, required installation space, and more. There are also other technical specification organizations which provide valuable guidance in addition to the ASSE. The USC Foundation for Cross Connection Control and Hydraulic Research provides a quarterly publication called Cross Talk and their website has a wealth of information on the topic. There is also the American Water Works Association (AWWA) website and their Manual M14 on Backflow Prevention and Cross-Connection Control. Protecting your drinking water should be one of your top priorities. Use these resources to stay up to date on the waterworks industry and backflow to aid in that protection.